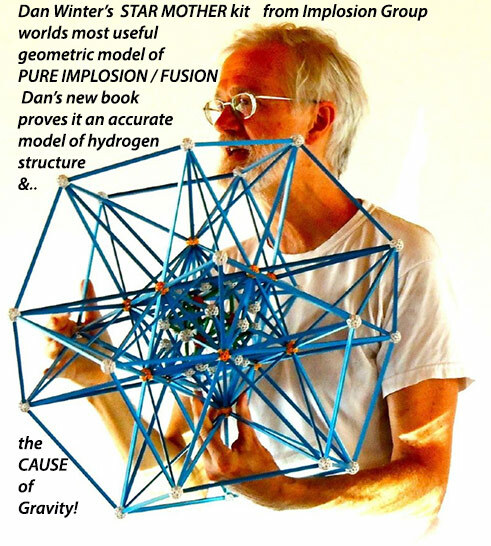 Worlds most useful geometric model of Pure Implosion/Fusion - An accurate model of hydrogen structure & the cause of gravity! The Star Mother Kit is an Ultimate Learning Tool for Sacred Geometry Modeling, from Dan Winter.. Kit includes the model and Dan Winters new book, plus trackable shipping. The hydrogen center bond of each codon is phase conjugate / fractal / implosive /negentropic! - - The center of each implosive CODON rung on the DNA ladder- IS the HYDROGEN atom which is precisely implosive / phase conjugate in nuclear structure: www.goldenmean.info/goldenproof Since Winters new equation proved that at least 3 radii of hydrogen are precisely whole number golden ratio exponents times planck length, it offers a corrected picture of the radii of hydrogen- at the heart of DNA's implosive braid: Phase Conjugate TORNADO- to the SOUL: the black hole wormhole down the center zipper of DNA!